I had the most humbling experience yesterday at Choma. We went to the markets and the gift shop at the museum as we have done the past four years. A couple of the supervisors go to the grocery deli to buy roasted chicken and chips, drinks, dessert for a picnic. I generally buy an extra meal in case anyone gets hungry and if no one eats it, I give it to the guard at the front gate for his lunch. This year as we were cleaning up from the picnic, I noticed a shabbily dressed older woman carefully watching the trash can. I assumed that she was going to raid the trash after we left, so I held out the extra food and offered it to her. She gave me the traditional handshake and slight curtesy that many Zambians give as a very polite greeting, then she got down on her knees to thank me. All I could say was, no, no please get up and of course she could not understand me. She did get up but still bowed several times. She did not ask for money but was willing to dig in my discarded trash for food. All I did was offer her the equivalent of a $3.00 plate of chicken and potatoes and she wanted to get on her knees. We are rich beyond our needs and we need to remember to get on our knees more! If you haven't been with us in the past two years you may not know that while we are here in Zambia, each Friday becomes Free Hug Friday. Everyone has to give me a hug before they can eat! Some of my friends know that I had to pass a written and practical driving test to obtain my CDL before I left for Zambia. It took two tries for one of the three parts for the written test but I did indeed pass it all with 24 hours to spare! So, here I am and I have this 22 (more if the little jump seats are put down) passenger bus that I am driving around the dirt roads. Tomorrow is the real test! I have to drive it 75 miles to Choma, through their "downtown" area and find a place to park it so that we can have our annual picnic on the museum grounds. My biggest concern is turning it around to head back home! I think I might have to go out of town to try and turn it around! The good news is that everyone is patient with me and as of yet no one has screamed out of fright! I know I only posted one time last year. We were a little short handed in the supervision area and I had to supervise the entire time. This year we have the luxury of having an extra supervisor so I am free to help supervise when needed and carry out adiministrative tasks when needed. We have a great group! They are excited to be here and eager to work with the babies and toddlers at the Haven. I will try to post a photo here and there but our internet is still a little iffy so I don't know when I will get to post! The student blog is www.hizpath2012.wordpress.com They write great things and we would love for you to read it! Here we are again! Different students, same excitement! We had some travel drama, like me not having a seat on the first plane leaving Memphis (the desk clerk checked me OUT instead of checking me in after I had already checked my luggage!). So, they kicked off a standby passenger after 20 minutes of trying to figure out what to do! They flight from DC to Addis Ababa was not awful at all! I had enough room because Jill was sitting next to me and she is tiny! But there was plenty of leg room. I kept thinking that Gene could have made that trip with all the leg room we had. I must now tell my readers that I truely hate PCs. I want my Mac! I am just learning the iPad but this PC is so frustrating! I can not get my clipboard contents to paste into this blog....so I am going to say that I miss the students from past trips but this group is shaping up to be terrific!! Photos soon. One year ago this very week, we were praying that Lydia would survive. Here she is! Isn't she precious in her Minnie Mouse outfit! We lost one of our sweet babies during the night. She was just not strong enough to make it so she is now with Jesus. It was hard on us. We had our talk about the fact that it might happen but until it does you never quite know how the group will react. I am in many ways glad that Ian was not in town of the burial. He and Dan had gone to Lusaka to pick up Keri. 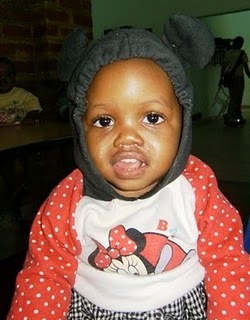 Ian has a very, very tender heart and he prays EVERY day for the sick babies by name. So, we watched as a tiny particle board coffin was laid in the African soil. Sweet hymns in Tonga accompanied the service. I was also struck with the fact that everyone remains while the dirt (mixed with branches) is shoveled back on. All the males that were present each took a turn shoveling the dirt. That was a very impressive sight. going to be in a very "Lion Kingish" location to celebrate Ian turning 13 that we needed to have some type of spectacle! Sarah has "Circle of Life" on her iPod, Jaime has portable speakers and we are always ready for a spectacle. 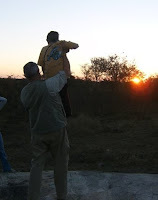 As the sun was setting, we cued Dan to lift Ian up towards the sunset, the song began and the students all acted like they were the animals bowing toward Ian. It was priceless!! Ian was taken totally off guard and was laughing his head off! There is an article about last year's program in the current Searcy Living. Ashton did a beautiful job of writing the article. I will have to blog about today later on....so much is happening....in one day!! The first year that Sara, Dan and I came to Zambia (2008) to scout the place out. We were advised by many who had been here before not to rent a car. We didn’t listen and we rented a car. We were also advised by many who had been here before not to drive after dark. We did listen and we did NOT drive after dark. There are many reasons not to drive at night here. 1) Lots of people walk at night and you can’t see them very clearly, 2) there are very few street lights, 3) there are many who are drunk and unstable as they walk in the darkness and they can stumble into your path, and 4) there might be animals in the dark!!! Last year (2009), I had to drive in the dark once or twice out here on Namwianga property and I had to drive a short distance in Livingstone in the dark. I survived but it was a hair raising experience. This year I have already been driving around in the dark like I have good sense. First, I drove the whole group out to Victoria Falls and back to the hotel in the dark. Then, tonight we had a situation. Webster, our night watchman was ill. I am not sure exactly what the illness was but he had already visited the clinic and received a couple of kinds of medicine then was back on our porch shaking and obviously in pain. I told him that he should go back home if he was ill and he said, “No, Madame. I can not ride my bicycle.” I could not let him sit there in pain so I asked him where he lived. He said in Kalomo and I said we are taking you home. So I rounded up Dan and Ian, we put Webster and his bicycle in the back of Khaki Jackie and we headed to Kaloma. At 7:45 at night. In the dark. In Zambia. We had to stop once for him to be ill but we plodded all the way to Kalomo. Then we had to get to his house, In the back roads behind the hospital. As he was telling me to turn left and turn right on dirt lanes with NO street lights I was wondering how we would be able to find out way out. As if reading my mind, Webster said, “Madame, when we get to my house my brother will ride back with you to the hospital to show you the way back and then he can ride the bicycle home.” And that is exactly what happened but first Webster had to take off his boots so that his brother could have a pair of shoes to ride on the bicycle in the dark. They share a pair of boots. So, I drove for about an hour in the dark tonight and discovered that I am wealthy beyond measure because I don’t need to share my shoes with anyone. Those have spend any time in Zambia know that if a vehicle drives by and has any space in it at all, then you generally pick up the individuals who might be walking and drive them into town or maybe out to the clinic, or whatever direction you are going so that they might be a little closer to their destination. Eliie Hamby says that the Zambian motto is there is always room for one more. The other day Dan, Ian and I had to make a run into town to check on the immigration office since we all have to have our Visas renewed on the 17th of June. We drive Khaki Jackie, our 12 passenger Land Cruiser. We stopped at the clinic to pick up several who were waiting for a ride into town and suddenly we had 15 people crowded into the back of Khaki Jackie and three of us in the front. Always room for one more. So, this afternoon we drove all twelve of us into Kalomo to boost the local economy by purchasing every piece of chitenge material available. On the way home, we had to pass several groups of people wanting rides back out to Namwianga because we were full. I was driving and suddenly, we saw a young man from Dan’s class standing by the side of the road with his white cane. Yes, he is visually impaired. At the same time we came upon a speed bump so I slowed down. He thought we were slowing down to give him a ride and he began to trot toward the sound of the slowing car. Immediately from the back of Khaki Jackie I heard, “We can make room. We can get him in. We can’t let him stand there.” So, one got out to guide him into the back side seats and make sure the door closed and Ian crawled into the front seat with Dan and me. Off we went back to Namwianga. This is why I love these students. This is why I love my job. They constantly do things that make my heart overflow with joy and my eyes overflow with tears. They understand the true meaning of servant heart.